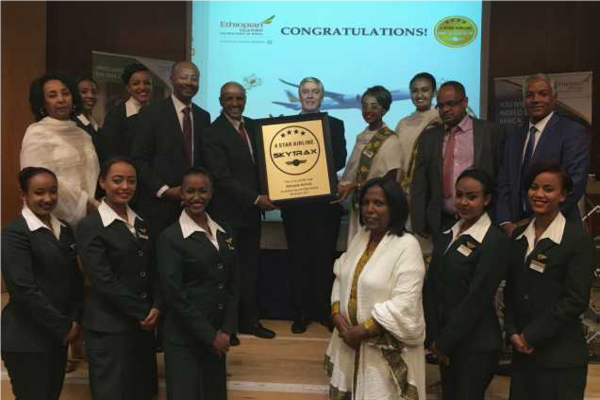 Africa’s largest airline group, Ethiopian Airlines, is pleased to announce that it has been awarded SKYTRAX 4-Star certification at a special ceremony held in London on November 8, 2017. NEW YORK, NY, November 10, 2017 /24-7PressRelease/ — Africa’s largest airline group, Ethiopian Airlines, is pleased to announce that it has been awarded SKYTRAX 4-Star certification at a special ceremony held in London on November 8, 2017. SKYTRAX is respected as the most prestigious international air transport standards and quality rating organization. Ratings are determined through direct and professional auditing and analysis of quality of service standards. Ethiopian Airlines is a multi-award winning airline and has previously received SKYTRAX World Airline Award for Best Airline Staff in Africa, two times and earlier in 2017 Ethiopian received SKYTRAX World Airline Award for Best Airline in Africa. Ethiopian Airlines is also pleased to announce that it has finalized preparations to start five weekly flights to Buenos Aires, Argentina starting March 2018. The new service will launch on March 8, International Women’s Day. To mark this important occasion the inaugural flight will be an All Women Operated Flight. Buenos Aires will become Ethiopian’s 6th destination in the Americas. Ethiopian has service to Washington, New York, Los Angeles, Toronto, and Sao Paulo.